The brewing industry worldwide produces close to $300 billion in revenue, comprising multinational companies as well as many micro- breweries. Brewing processes generate carbon dioxide and can create environments that may be hazardous to operators working throughout these facilities. Carbon dioxide is present in fermentation and carbonation processes as well as within other brewing facility processing and bottling areas. Carbon dioxide is considered to be a heavier-than-air gas, with current TWA of only 5,000 ppm. Current IDLH (Immediately Dangerous to Life and Health) is 40,000 ppm, or 4% by volume. Infrared gas monitors from MSA permanent instruments recently enabled a global brewer to achieve the best solution for their application. 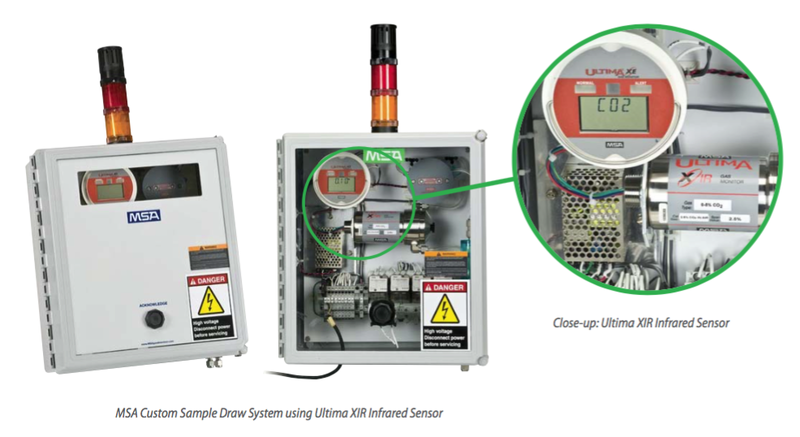 MSA provided a sample draw system using a standard MSA Ultima® XIR Infrared Sensor with range of 0-5% by volume. System design had to meet this facility's instrumentation standard as well as provide necessary outputs and contacts to properly integrate with each facility’s existing communications network. Audible and visual alarms are part of the NEMA 4X system required to function within these very wet areas; a special end-of-line lter was also developed. These systems must operate 24/7 with very low maintenance requirements, resulting in overall low cost of ownership. MSA, working with the brewer, jointly developed the product and program that was introduced to all key instrumentation and electrical technicians as they upgraded each facility. MSA provided not only site start-up, but also site-specific operator training to transition to this new design as transparently as possible. With a nationwide network of eld service personnel, MSA supports these systems in a timely manner, at reasonably low customer cost.